We’ve officially entered summer and I couldn’t be happier to be in the season of BBQs, potlucks, and lakeside snacks. As usual, I’m committed to creating delicious, healthy foods that everyone can enjoy. This recipe is a favourite of mine from years ago and, with a few small twists, its back in my recipe book for the summer of 2018. Its made with clean, unprocessed ingredients that will help your body feel and look its best. Try it out and let me know what you think! Boil a pot of water large enough to hold all the tomatoes. While the water heats up cut an “X” into the bottom of each tomato (see picture below). Once the water has boiled, gently add tomatoes, remove from heat, cover, and blanch 4 – 5 minutes. Remove with a slotted spoon and let sit until cool enough to handle. Gently peel the skins off of each tomato and discard. Cut tomatoes into quarters and remove seeds and juices (see picture below). TIP: I find it easiest to do this with my hands. Dice tomatoes into small pieces. In a large bowl, combine diced tomatoes, basil, white onion, olive oil, balsamic vinegar, garlic powder, sea salt, and black pepper. Stir to combine. Let bruschetta chill in the refrigerator for 1 hour to blend flavours. Slice a French baguette into 1/2 inch pieces. Gently toast and let cool. 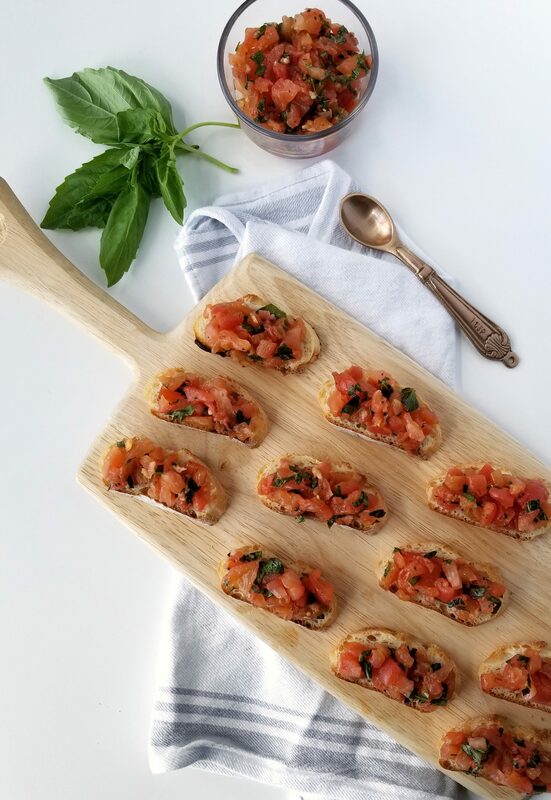 To serve, spoon a generous amount of bruschetta onto each baguette slice. Enjoy!